Seat Tarraco Performance, Engine, Ride, Handling | What Car? 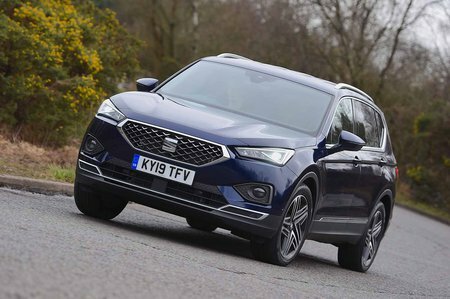 The Seat Tarraco’s engine line-up kicks off with a 1.5-litre turbocharged petrol engine with 148bhp – badged 1.5 TSI Evo. Although this engine impresses in some other VW Group cars, it feels a bit underpowered under the bonnet of the hefty Tarraco. It feels gutless from low revs and, even when worked hard, offers less performance than the 128bhp 1.2-litre three-cylinder petrol engine found in the Peugeot 5008. Then there’s a duo of 2.0-litre diesel engines, with 148bhp and 187bhp, named 2.0 TDI 150 and 190 respectively. With plenty of low-down grunt, even the former feels noticeably stronger than the 1.5 TSI Evo and offers more than enough pace for a large SUV. The 2.0 TDI 190, meanwhile, is matched for pace by a top-of-the-range 2.0 TSI 190 petrol, but the diesel engine offers more effortless pulling power. Overall, though, the 2.0 TDI 150 offers the best balance between performance and fuel economy. A six-speed manual gearbox comes as standard, along with front-wheel drive, but a seven-speed dual-clutch automatic ’box and four-wheel drive are also available. 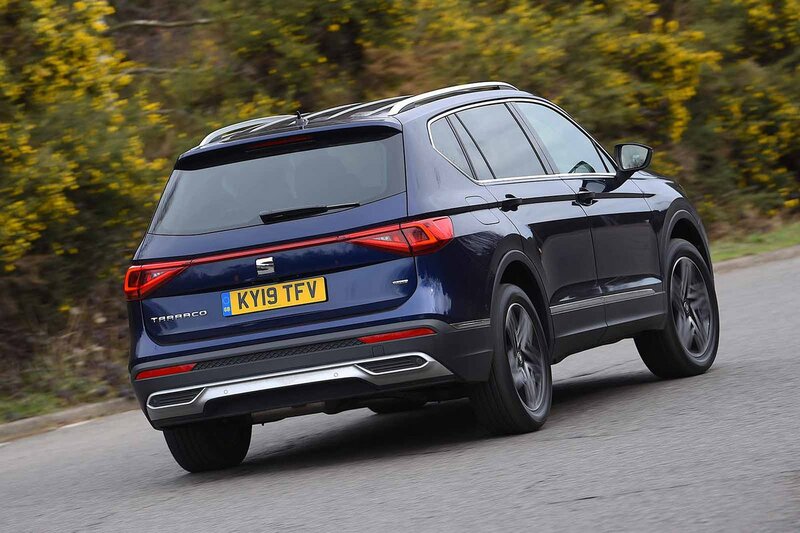 Despite its hefty size, and the firm suspension set-up Seat has chosen in order to give the Tarraco a sportier feel than its Kodiaq cousin, the standard 18in wheels let the Seat absorb most surface imperfections well, smoothing out drain covers and motorway expansion joints easily. Only sharp potholes make it judder, but it’s still nothing too back-breaking. Take the Tarraco down a country road with lots of dips and crests, though, and things feel less settled. Such undulations will have passengers moving around in their seats, and the Kodiaq, Peugeot 5008 and Volkswagen Tiguan Allspace all offer a more composed overall ride. It’s worth noting that the Tarraco is the first Seat to give buyers the option of 20in alloy wheels, and these can’t disguise small bumps as convincingly as the 18in wheels do. 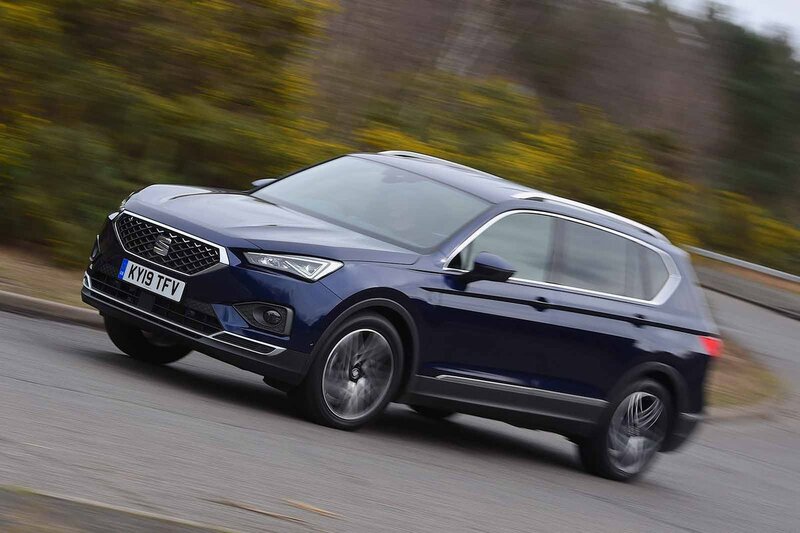 The upside of the Tarraco’s suspension is that it does indeed make the car feel sportier than its rivals – although only to a point. There’s less body lean through bends than in the Kodiaq and 5008, but the Tarraco patently isn’t as agile as the smaller Ateca. More positively, the Tarraco is a doddle to thread through traffic and easy to place accurately in sweeping corners, thanks to light, precise steering that weights up reassuringly on faster roads. All of the Tarraco’s engines are pleasantly muted, especially compared with the units in the Kia Sorento and Nissan X-Trail and even the premium Land Rover Discovery Sport. Even the 2.0 TDI 190 diesel only hums noticeably when worked harder. There’s very little wind and road noise audible from inside, which makes for comfortable motorway travel. The six-speed manual gearbox has a slick gearchange, but a numb clutch pedal. The seven-speed auto, by comparison, can be reluctant to change down on demand and generally feels a bit hesitant.